Since the beginning of the year I have started my journey into understanding the Grace afforded us by God. 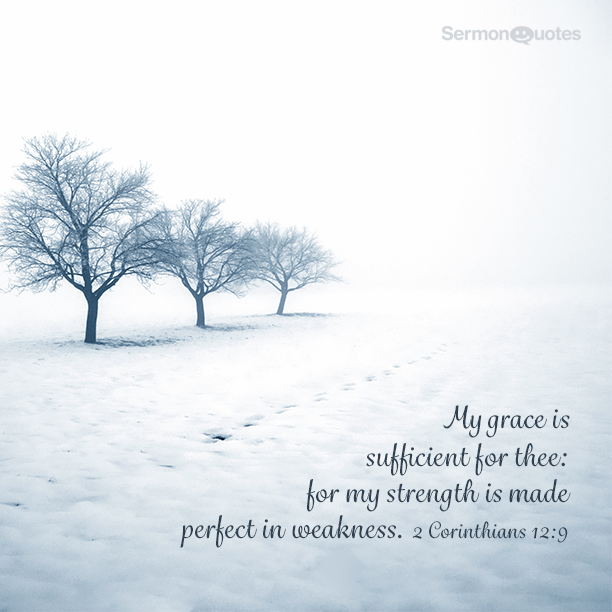 In Second Corinthians 12, we find Paul pleading with God to take away his weakness yet God responds to him saying, “My grace is sufficient for you, for my power is made perfect in weakness.” God is not saying I will or I won’t. He is asking Paul to trust Him – there is a greater plan, one that will glorify God and showcase the awesome power of Jesus. God does not give us trouble-free lives nor does he delight in our suffering. God does not answer all our questions because he wants us to remain humble and rely on his grace. But God does reassure us that he is with us in our times of trouble and weakness. Like the serenity prayer says, “God grant me the wisdom to ACCEPT the things I cannot change.” To accept is an action, it is DOING something – even if that something is causing us pain (emotional or otherwise). Leaning into God’s word and praying for the circumstances of our lives may be all we are asked to do in a situation and trust that is better than forcing a change of our own will. This to me is the major reality of the book of Job. The inscrutable mystery of innocent suffering. God ordains that His children walk in sorrow and pain, sometimes because of sin, sometimes for chastening, sometimes for strengthening, and sometimes to give opportunity to reveal His comfort and grace. But there are times when the compelling issue in the suffering of the saints is unknowable because it is for a heavenly purpose that those on earth can’t discern. I have come to recognize that as I spend time each year with the word and verse I want to dig my teeth into that it is not always pleasant. When I am in the fire I wonder why I asked of this in the first place but then I get days like today when I am brought to a deeper understanding. I am affirmed that God’s grace really is sufficient and I can feel it. I am asking to make the lessons I want to learn more effective in a sense. It’s like praying for patience. You probably have a some troubles in your life that require you to have more patience, so by praying for more patience it may not be taking the problems away more quickly, it may be shining a light on them that only magnifies it and can feel like more trouble rather than less. It’s allowing you to grow and experience more “ah-ha” moments that will strengthen our faith. This entry was posted in Faith, Inspiration, Motivation, Reflections and tagged Book of Job, christian living, grace, prayer, strength, weakness. Bookmark the permalink.